Ian Boddy is a prolific British electronic musician and composer. He has been active for over 3 decades with numerous releases and contributions to many international labels such as Flowmotion, Mirage, Signal Records, Colin Potters ICR (Integrated Circuit Records), Third Mind, his own label DIN Records (founded in 1999) and many more. 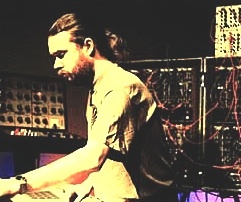 His creative output has been influenced from the 70’s German Krautrock/electronica and especially bands like Tangerine Dream and Klaus Schulze. In the late 70’s and early 1980s Boddy began experimenting at an Arts Council funded Studio in Newcastle called Spectro Arts Workshop, where he was able to use the facility and its equipment (e.g. VCS3, EMS, etc.) to compose and record his first compositions. This early period resulted in 3 cassette releases on the Mirage label, which showcased Boddy's work with analogue synthesis and tape manipulation. "Images" (1979/80), "Elements Of Chance" (1981) and "Options" (1982).